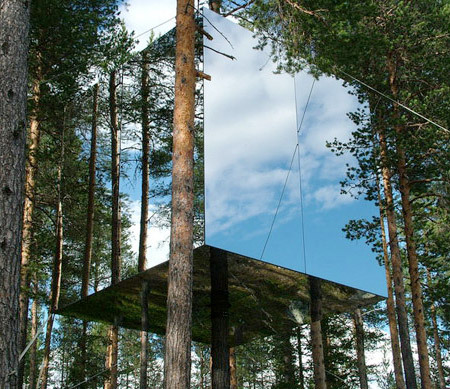 Unique tree hotel covered in mirrored glass was recently opened in Sweden. 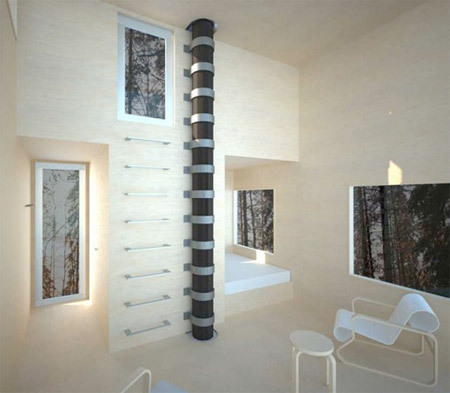 Designed to be accessed by a rope bridge, the Mirrorcube suite comes with a double bed, small bathroom, and a terrace on the roof. 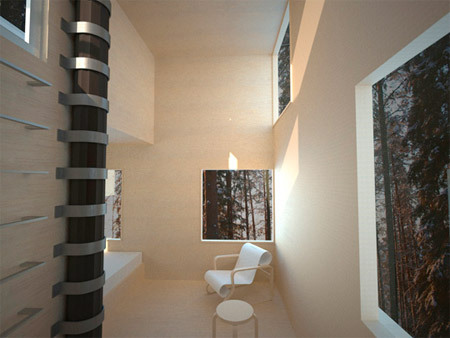 To prevent birds from colliding with the treehouse, the glass was laminated with infrared film that only birds can see. Sadly, Tarzan, having only a human’s vision, was found crumpled in a heap below the new hotel. Great idea, I wish see it. Awful to think of the many birds that fly right into it. how the heck do you get up there? don’t see any stairs up the tree or anything. hey, what the hell where they thinking, to build something so dangerous for the birds flying around??! what kind of people would do such a thing? Read the description before comenting please. I just don’t understand how the tree can hold such heavy structure. 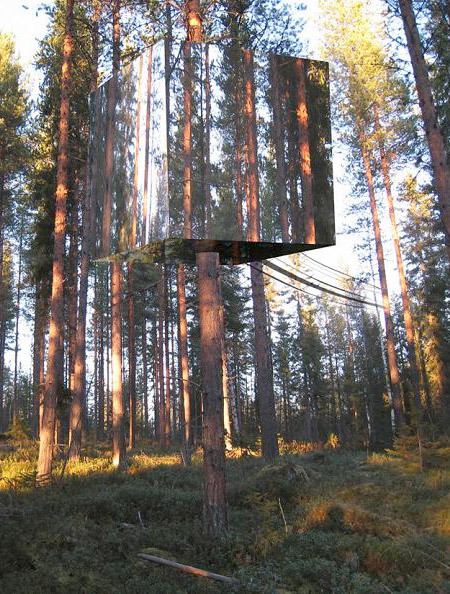 Conceptually and esthetically really interesting as a site specific art work. Says a lot about illusion and perception in our mediated culture of blurred boundaries. Terrifying to actually inhabit. Not for leisure. More like a fascinating psychological experiment. And in Sweden too! And yes, it is not like those sadistic commercials for glass cleaner with birds crashing into glass doors. It’s protected. Besides birds don’t usually go crashing into each other head-on. Just people. And animals with antlers. Think about that. P.S. I have walked across one of those rope bridges (that’s how you get to this cube) way up high in the jungle in Costa Rica – a lot farther up than this one is – and suspended across a huge gorge. REALLY really scary. 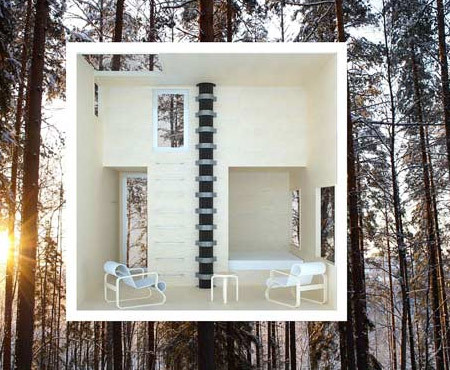 The question is – how do you get up the tree at the other end to this one? Rope ladder? No thanks! Might be an interesting place for a meditation retreat. Or — lock up the leaders of two “warring” parties until they come to terms of agreement. No escape. As a metaphoric image that works. hey that was there from very long ago…. Wow! 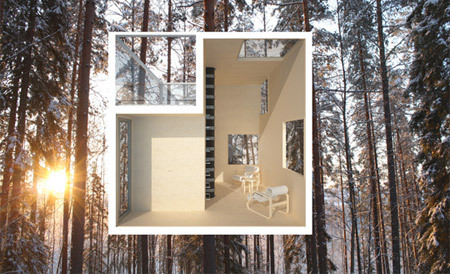 It’s like you have a comfty house plus a wonderful view outside, around it. did anyone spot the bathroom? or do you go to the bathroom…. the natural way? I never believed i’d see a modern one ! Why don’t some of your READ first? Is that too much to ask? Does anyone here read before they comment???? 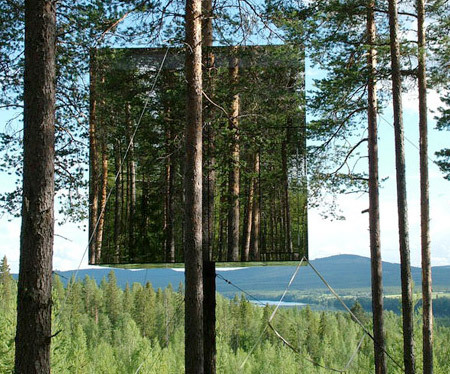 I think that the tree-climbing effort and required assembly effort for the mirrors is a lot more than the artistic value of the results justifies. And don’t forget, the Humane Society will attack the “artist” in connection with the deaths of all of the birds which splatter on the mirrors. A definitely abortive attempt at gaining artist status IMO.